Hailed for her "deep, honeyed voice" (Graham Watts, Ballet.com Magazine), and "low tones of awesome resonance" (Richard Dyer, The Boston Globe), American mezzo-soprano Deborah Rentz-Moore performs with many celebrated ensembles, including the Handel & Haydn Society, Emmanuel Music, The Boston Camerata, Ensemble Tr`s., The Boston Early Music Festival, Aston Magna, New York Collegium, Magnificat and the Mark Morris Dance Company. She received BA and MM degrees in voice from Skidmore College and the University of Michigan (respectively). 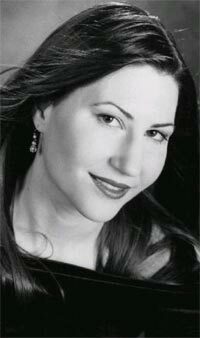 A specialist in early music, she also performs opera, oratorio, and chamber music from many eras. This season includes appearances as Dido in Purcell`s Dido and Aeneas with Aston Magna, as the Sorceress in the same opera with the Mark Morris Dance Group, Messiah with Worcester Chorus, a critically-acclaimed recital of Purcell and Handel arias with Aston Magna, Shaker music with The Boston Camerata and Tero Saarinen Dance Company, Israel in Egypt with The Newton Choral Society, St. John Passion with Masterworks Chorale, Haydn`s Paukenmesse with Berkshire Concert Choir and Monteverdi madrigals with Aston Magna. Her recordings include music of J. S. Bach and Cozzolani on the Musica Omnia label, Shaker songs on the Glissando label, baroque holiday selections with Ensemble Tr`s. and Monteverdi`s Orfeo with Aston Magna.